For Great Lent this year, our family has undertaken a cooking video project in which the girls plan to demonstrate one of our family Lenten recipes for each week of Great Lent. It is a great opportunity for them to work on several skills including working together in charity, planning, and presenting. We had intended for them to learn some video editing skills as well, but their parents are still trying to figure that out. The project also gives us the opportunity to share fun, kid-friendly recipes that our family has enjoyed during the fast. The recipe can be found here. If you would like to receive notice of future episodes, please follow my blog. Stay tuned as well for the bloopers. We hope you enjoy the video. Please leave comments to encourage the girls. I know, I know. Your (home)schooling year has probably come to an end. Nevertheless, I just found the following Orthodox prayers for students and wanted to pass them along to you. The URL to the Orthodox prayer book in which I found them is printed at the bottom of this post. I plan on printing and laminating them for the girls. Christ my Lord, the Giver of light and wisdom, who opened the eyes of the blind man and transformed the fishermen into wise heralds and teachers of the gospel through the coming of the Holy Spirit, shine also in my mind the light of the grace of the Holy Spirit. Grant me discernment, understanding and wisdom in learning. Enable me to complete my asignments and to abound in every good work, for to You I give honor and glory. Amen. Hannah loves to tell everyone that Rebecca’s birthday falls on the 6th day of Christmas. Some actually do the calculation and ask, “Do you mean December 30th?” Others just say, Oh, that’s nice!” However the day is designated, Rebecca’s birthday always falls outside of a fasting period. 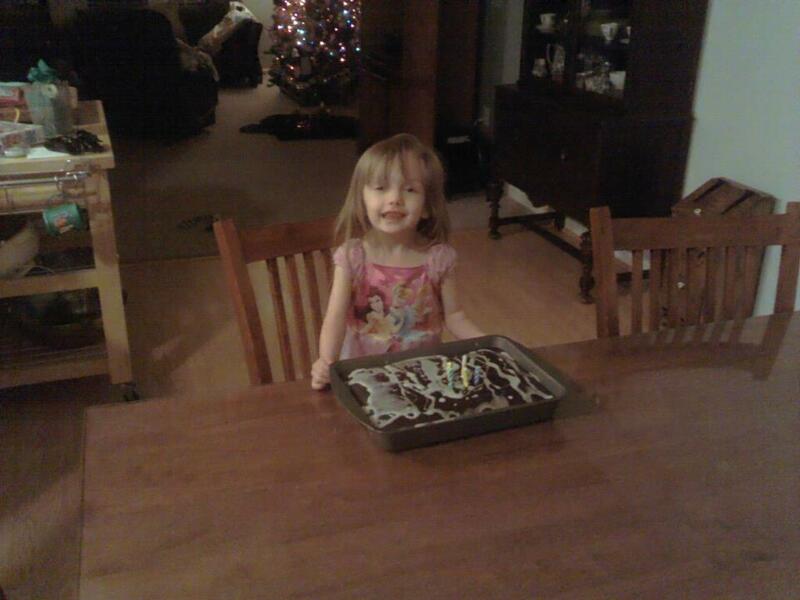 Even so, what kind of birthday cake does the child request for her birthday? A Lenten wacky cake! Measure flour, soda, cocoa, salt, and sugar into large mixing bowl. Sift dry ingredients three times. Add vinegar, vanilla, oil, and water. Mix well. Pur batter into greased 9 X 13 inch baking pan and bake at 350 degree in a preheated oven for approximately 45 mnutes. Let cool on a wire rack. ENJOY! While hot, cover with chocolate chips. Make a glaze with confectioner’s sugar, vanilla, and water; drizzle over cake. Coming Next: January 5th is Rachel’s baptismal day! This summer, the girls had fun watching the 2012 Olympics. 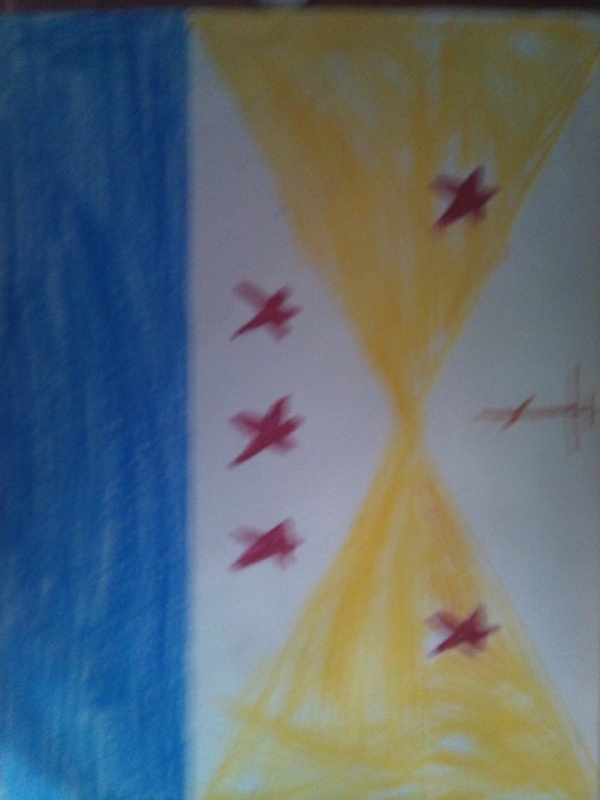 Rachel became interested in the flags of various countries and began to study them in her dictionary. Since we were gearing up for the beginning of the homeschool year anyway, I thought that the girls might enjoy the challenge of collaborating on the design of a family flag. I explained that their task was to describe who we are as a family and what we believe through symbols. The above picture is the final version. “We chose the colors blue and red because the Mother of God is dressed in those colors in an icon,” Hannah explained. “And gold because a censor is gold and the Byzantine cross because we are Christian,” Rachel chimed in. Of course, each red star represents a family member. Whether the girls realize it, the flag also displays a certain hierarchy – God, parents, and children. Father-Deacon Joseph and I were quite impressed! We plan on getting the flag custom-made (at a very reasonable price) for Christmas. In the first issue of the Proskomen! newsletter, I had put a plug in for Journaling Throughout the Liturgical Year, which is described by the publisher as “a creative and hands-on approach to studying, commemorating, and celebrating Pascha, the Twelve Great Feasts of the Orthodox Christian Liturgical Year, and the inspiring lives of a selection of twelve saints of the church.” This past week, we had our first, hands-on experience completing the project for the first Great Feast of the liturgical year, the Nativity of the Mother of God. Rachel, Rebecca, & Hannah working on their first “Journaling Throughout the Liturgical Year” entry. 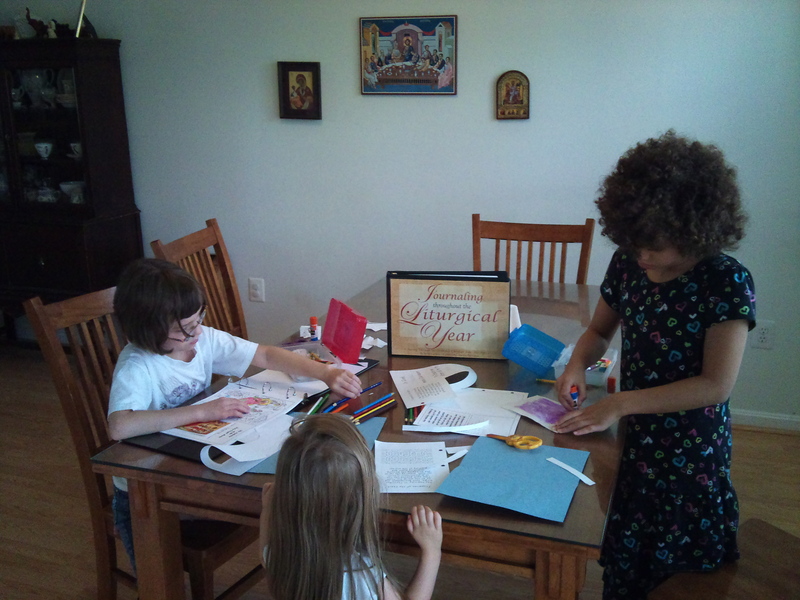 The girls enjoyed coloring the festal icon while I read about the feast from The Incarnate God, which described the icon’s rich symbolism. We joyfully sang together You nativity O Mother of God . 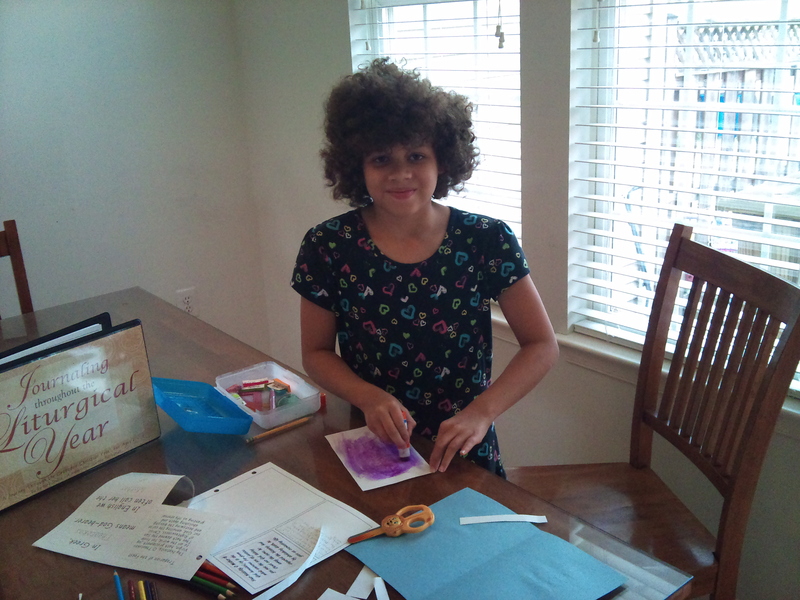 . . while the girls completed their cut & paste projects. The final product is a beautiful keepsake that the girls will cherish for years to come. Hannah was so excited about it that she took hers to Vespers to show the Fathers. Rachel plans to take hers after she completes the second entry, Exaltation of the Holy Cross. 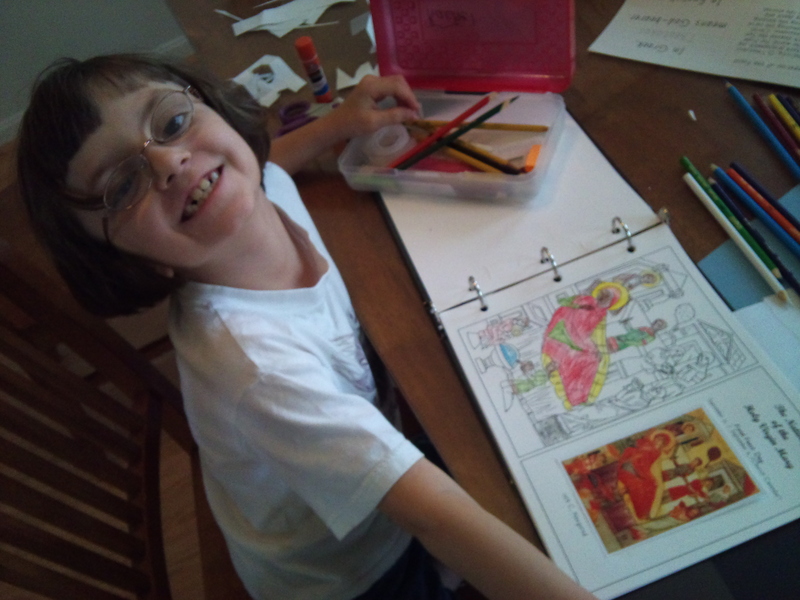 Rachel working on her icon of the feast. Journaling Throughout the Liturgical Year is a wonderful way to prepare the girls to celebrate the feast. Hannah preparing to glue the troparion of the feast. For more information about purchasing Journaling Throughout the Liturgical Year, please visit the website for St. Kassiani Press.